My husband and I had been married just a short time when he was discharged from the Air Force after four years service in the early 1960s. We didn’t have much money to live on, let alone extra money for entertainment or dining out. Times were tough for us. He was a new hire on the local police force, and we were settling in to civilian life in his small hometown of Willimantic, Connecticut. We liked a local diner with good food, good prices, and an ambience of friendliness and warmth. We saved our Change each week so that we could have one night out for dinner, either Friday or Saturday, at the diner. 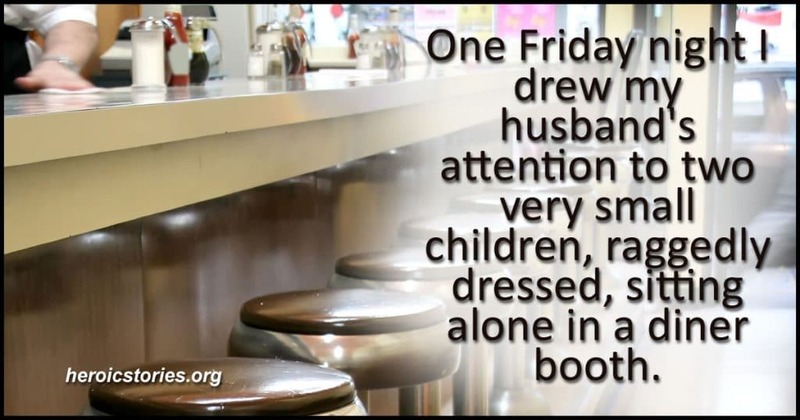 One Friday night I drew my husband’s attention to two very small children, raggedly dressed, sitting alone in a diner booth. They were 4 to 6 years old, a boy and a younger girl. Perhaps their mother was in the restroom. As the minutes passed, I noticed the children still alone, being served plates of the Friday night diner special: beef stew. The waitress was a chubby, personable woman whose laughter was easy to get caught up in. She was in her mid to late 50s, the grandmotherly type. We began to talk that night, and I asked her where the children’s mom or dad could be. She said the children came into the diner every evening with 5 cents each, held in their little fists. Their father was long gone, and the mother was a town drunk among other things. The mother told the kids each evening to go buy themselves something… and offered no food at her place, the waitress had learned. The waitress had discovered these children huddled on the street corner one evening a couple years earlier, hungry and all alone, poorly dressed for the winter months. So she brought them into the diner. During her evening shift six nights a week, she took as payment the 5 cents from each child — and gave them their only meal of the day. She also gave them peanut butter and jelly sandwiches to tide them over the weekend. Our hearts were broken. We began leaving extra money with the waitress to help take care of the children. We also hit thrift stores and brought in coats, boots and clothing. It was as much as we could afford. Other patrons began leaving items for the children, too. The owner of the diner was not thrilled with the whole idea, but didn’t interfere with the waitress and the customers of his diner. We lived in that town for 3 and one-half years, and as the children got older and into school, they got help with their homework from many customers at the diner. I have never forgotten that waitress. I don’t remember the name of the diner or the waitress, but I hope those two small children were able to grow up healthy and feeling loved. This is a great, heart-warming story. Much appreciated in these sometimes less-than-kind times. So glad to be following Heroic Stories! No one can help everyone, but everyone can help someone. Surprisingly, the one who give the most. Case in point, some years ago I taught a small group of high school students who were in my English second language class. It was Thanksgiving time and our school was having a food drive for starving children overseas. When I told my students about the drive, they were uncooperative and maybe a bit hostile. They asked why should they donate to people who probably have more then they than they did. I explained that some of these people were starving and some time they had to go days between meals. In fact, some villages did not even have clean water to drink. After that we passed the hat every day and my students gave what they could, mostly coins. One girl apologized for not giving to the cause because she had exactly enough money to buy her lunch. As she get class she gave me all of her lunch money. What’s this? I didn’t think you had any money to donate. I decided I didn’t need to eat lunch today. We were a small class in a rich school so we did not win the class award for the most money given, but we did get honorable mention for having donated the most money per student. I know this is long so feel free to edit as needed. I might be able to remember enough details to make it a stand alone story. What a touching story and what wonderful people. Thanks for sharing.